Exciting news! Eli’s pediatrician, the fabulous Dr. Rebecca Partridge, is starting a Down syndrome clinic for the Seattle/Eastside area. She has a son with Down syndrome and realized the need for a clinic in the area. She called me the other day to ask if she could use Eli’s picture for the brochure. He’s already a star! Of course I said yes. She’s chosen this picture because she said it’s “the most stunning picture she’s ever seen of a child with Down syndrome”. We are so flattered that she has chosen our precious boy to be the face of her project. I find it ironic that one of my biggest concerns after we received the prenatal diagnosis was if Eli would be a cute baby like his big brother. Here he is in his second month of life and already he’s a highly sought after model – ok, maybe that’s a slight exaggeration by a ridiculously proud mama but honestly, I think his extra chromosome just makes him extra cute! He stood there smiling insisting I take his picture. #hedressedhimself #sillykid #shortsoverpants #whynot? Coming soon to your television screen – Eli! 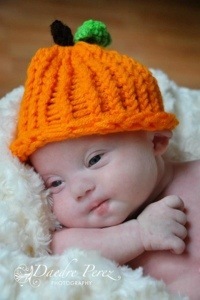 For women facing the possibility or reality of having a child with Down syndrome. An unexpectedly wonderful journey loving our baby with "designer genes"